Captain Eric “Hawk” Kelly is a British cop who travels to Montreal, Canada because his stepbrother, Jack “Soldier” Kelly - yes, the infamous “SnakeEater” himself (we’ll explain later) - has died in the line of duty. As it turns out, the streets are being overrun by rival gangs - the neo-Nazis (their gang is called, scarily, the Death Skulls) and the Asians. However, the big boss man is the intimidating Elias T. Garr (Magda). 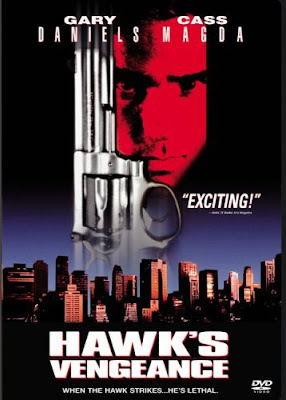 Teaming up with Soldier’s former partner Lizzie (Heitmeyer), and Li Po Chung (Chiang), a scrappy street dude, Hawk seeks...well...VENGEANCE on his beloved stepbrother’s killers. Will he succeed? Confusingly enough, this is the fourth film in the SnakeEater series popularized by Lorenzo Lamas. Sadly, and without warning, however, the SnakeEater has eaten his last snake and died. Don’t worry, it’s not a spoiler - at the opening of this movie, it’s like, “Oh, SnakeEater is dead. Ho hum.” No flashbacks, no blaze of glory, nothing. Perhaps Lamas was too ensconced in taping an episode of Are You Hot? (A real show, and the pride of the U.S.A.) to care to be involved. His loss is our gain, as the super-likable Gary Daniels fills in. Sure, they try to justify SnakeEater (1989) having a British step-brother plotwise - and, preposterously, a character even says to Hawk, referring to Soldier, “You look like him.” Never mind that it’s supposed to be his stepbrother. But it really doesn’t matter, because the presence of Daniels and his martial arts are all that’s really important here. There should have been some more action scenes, and this movie lacks the intensity of Daniels’ PM work, especially the excellent Recoil (1998), but Hawk’s is still worth seeing. Thanks to his Asian sidekick, there’s plenty of good-natured racism that, once again, you’d never see today. Plus, if you’ve ever wanted to see an Asian gentleman and Gary Daniels dressed as Orthodox Jews and shooting people, your lucky day is here. Thanks to that, and some “cheesy” (you’ll see) lines, there are some laughs in store. Cass Magda plays the baddie who stick-fights in his spare time, and you know the white supremacists are evil because one of them sports a “Satan” tattoo and their band Hatebeast plays at Club Anarchy on the weekends. 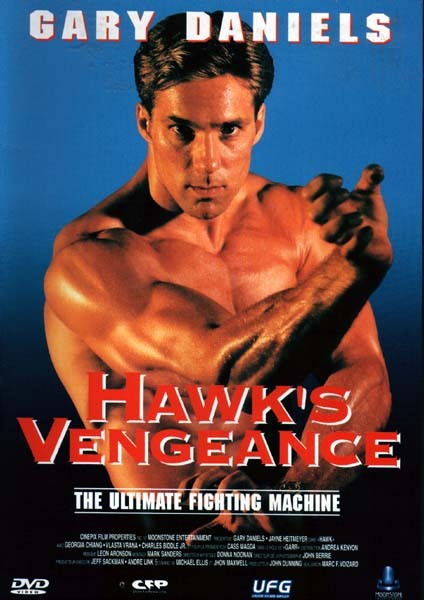 The bottom line is this: Hawk’s Vengeance is fairly dumb, but the charm of Gary Daniels carries the day. Yeah, this could have been stronger but it's far from Daniels worst. A few decent fight scenes but nothing spectacular like Bloodmoono. I think it's also probably the first film where they openly acknowledge his being British rather than gloss over it. I had no idea they were connected to the Lamas Snake Eater movies. Are they any good? I do want to check out this one, I've had an eye on it for a while now. Jack: Totally agree. This could have been better, but it's not too bad overall. Only have seen SnakeEater 1...which was just Ok...will be watching\reviewing the sequels soon. Explosive Action: Cool. Gotta love Daniels. Interested in your take on it. This is too funny. I just got this from Netflix today. Our taste in Daniels movies is downright eerie. Haha. Another odd Daniels coincidence! It's not up to par with the rest of the series, but it's still entertaining. Definitely agree with you. Would be interested in an 5th, if Lorenzo's character wasn't dead...they could team up and destroy more baddies! Or better yet, they could retcon his death and say he faked it or something like that, and both Daniels and Lamas could team up. Sounds good! It's not too late...Lamas should be in more DTV action movies all he does now are Sci-Fi movies.